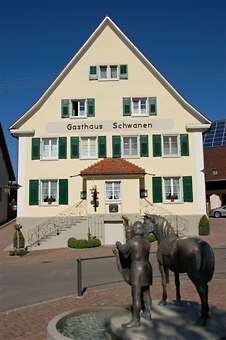 The Gasthaus Schwanen is a textbook example of country inn and has been family owned for three generations. Today Alexandra and Markus Wekerle are dedicated to maintain its home-like atmosphere and to cultivate familiar hospitality out of tradition. Alexandra Wekerle comes from the Upper Bavaria, she is a restaurant manager and landlady in the best sense of the word. Thus she ensures amiably the comfort of her guests thanks to an attentive service. Markus Wekerle is a passionate chef de cuisine. He serves you select Badenese delicacies or fancifully composed pleasures for every gourmet - just ambitious culinary art at international level. The menu is influenced by the carefully chosen ingredients from the region, by the game dishes from the own hunting grounds and the seasons. Constant quality based on guaranteed fresh products is more important than fleeting fashions. All good reasons for the food critics of the Michelin Guide to award the symbol Bib Gourmand to the Gasthaus Schwanen. The Hotel Schwanen in Stühlingen is supporting member of the organization Slow Food Germany. The German guide ”Schlemmeratlas“ awarded the Schwanen 2 cooking spoons for an outstanding price-quality ratio and an excellent wine list. The ”Varta Guide“ awards the Country Inn Schwanen with a diamond tip as well equipped restaurant and a further Varta tip was awarded for a remarkable restaurant performance. The German ”Feinschmecker Restaurant Guide“ awarded the Country Inn Schwanen 1,5 Gourmet “F”s as recommendable restaurant. The Hotel Schwanen in Stühlingen received the Bib Gourmand award of Michelin. The County Inn Hotel Schwanen is partner hotel of the golf club Obere Alp in Stühlingen. Hotel guests get 20% Greenfee reduction.